Following my opening piece for The Sporting History Boys on the development of Rugby and the schism its popularity created I have decided to dedicate my next piece to a sport close to my heart - Tennis. We have written in the past about the Victorian Sporting Revolution and what it brought to Britain - new questions of class, identity, gender and even politics. As well as the obvious codifications of Football, Rugby and Golf it also brought Lawn Tennis to the forefront of sporting debate. For my dissertation last year I decided to look deeper into this rise and find out just how lawn tennis developed and evolved into the cultural phenomenon it undoubtedly was. Don't worry, this won't be 10,000 words long - but let's see just how Tennis came into being and why it was so popular. In our most recent articles about spectatorship and the great rugby schism of 1895 - two themes have been discussed more than any other - Class and Identity. In Victorian England, both of these were important issues as industrialism continued to grow and suffrage was beginning to be given to more and more of the populous. We have seen through football and rugby that despite middle-class origins both attained the support of the working classes bringing their very sports into question - lawn tennis' infancy is however somewhat different - but why? Let's start at the beginning. Sphairistike. No, this isn't a made-up word to start a paragraph but it is actually the original name of Lawn Tennis. Not very catchy is it? It didn't last long following Major Walter Clopton Wingfield's codification of the game in 1874. Of course tennis had existed before this date, being played prominently in medieval Europe and even later in its 'real' or 'royal' form. This indoor version of the sport was hardly compatible for most who wished to play and so Wingfield created a game, admittedly at first a commercial venture, which could be set up on the lawns of aristocratic gardens. The game consisted of a net, pegs and the essential racket and tennis balls. Perhaps the only oddity in such a sport was the hour-glass shaped court to help with the 'science and beauty' of the venture. The reasons for such a focus on sport in Victorian England are fairly clear - for most middle-class males at least it all came from the public school system. 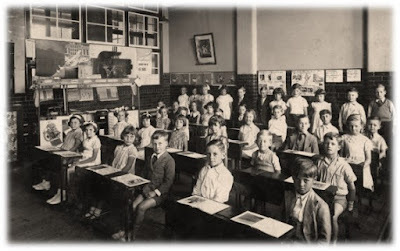 As we have seen with football, cricket and rugby, the public school system was strongly represented in each. The idea of a 'muscular christianity' had developed in private education following the debacle in Crimea and the 'increasingly unchristian and ungentlemanly' conduct of many students. Sports, like Tennis, could bring these ideals of fair play and discipline back to the forefront of society and to the frontline of the battlefield - seen no more clearly than in the poem, 'Vitai Lampada'. Newbolt's allegorical idea of cricket and war sitting hand in hand was one which was echoed widely amongst the middle and upper classes. Sports like croquet had little opportunity to promote these ideals and gradually its popularity began to wane. Before the introduction of lawn tennis to the sporting calendar of Britain, croquet was arguably the sport of choice for most wealthy members of the public - at least socially speaking. Croquet offered a slow paced game and a chance for conversation when playing, leading to inevitable flirtation between the sexes. However, by 1874 there is no shortage in articles displaying their disdain with the 'intolerable and tedious' fashion of croquet. Simply put, lawn tennis could offer everything croquet could, and more. Lawn tennis was a breath of fresh air to the upper-middle-class elite, who were no stranger to hosting garden parties of up to 350 people, with tennis being one of the main attractions. What is important to ask when discussing lawn tennis is whether the game was played for competition or merely as a leisure pursuit. Certainly, the lack of competition in croquet was a major factor in its downfall, tennis required more skill - admittedly the aim was more to take part than to win - but like any sport, triumph eventually became essential. "By whomsoever the game was first invented, or wherever it was first played, to Major Wingfield belongs the credit of having first introduced it to the public; and undeveloped as was the form in which he brought it forward, yet we owe him thanks for the popularity of an amusement which is not soon likely to lose its hold upon our customs. It appeared at a critical time. The popularity of croquet was on the wane. An excellent game in itself, croquet afforded amusement to only two persons. It was voted intolerable to the spectators, and tedious even to the players. It took an inordinate time ; aud, even of the two playing, one was always out in the cold, while the other was producing by his skill a peculiar feeling of irritation and disgust not to be found in other games, and foreign to a wholesome spirit of rivalry." And this bring us to Wimbledon. The All England Championships at SW19 can offer us the greatest barometer as to the popularity of lawn tennis. The inaugural tournament was founded in 1877, just three years after the game's codification. 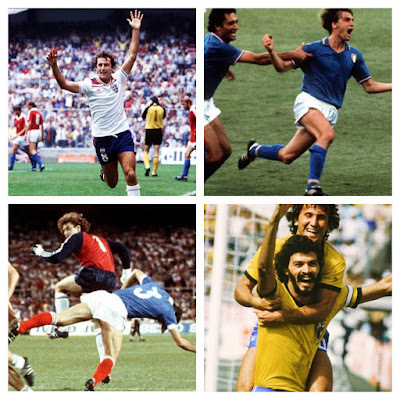 This short turnaround from invention to competition is impressive in comparison to the nation's other major sporting tournaments - The FA Cup for one took place 9 years after football's codification. Indeed, the Pall Mall Gazette is accurate enough in its praise for the game - Lawn tennis' popularity was sudden and universal. So what of the first Wimbledon championships? Played between 9 July - 19 July it was won by Spencer Gore, a former Harrow schoolboy who grew up within a mile of the All-England Club. 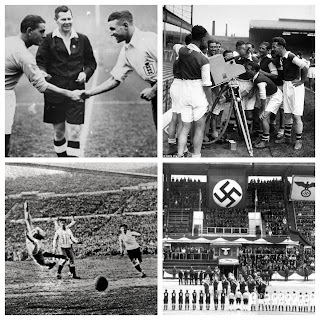 The final was witnessed by a 'fair number of spectators' and described as 'great treat to those who loved the game'. The national reception to the establishment of a serious competitive tournament was one of relief - "at last we have a game most interesting, as illustrated by the meeting at the All-England Club Ground, Wimbledon." So far I have discussed the infancy of tennis is some detail but have yet to discuss one major factor in its universal popularity: Women. This is what sets lawn tennis apart from other games invented during the sporting revolution. TFHB has often written about women's football, especially before 1918, with sport as a whole often seen as hardly befitting of a lady. However, lawn tennis was to be one which women truly had a chance to compete - sometimes even against men. Just a year after the codification of the game, The Morning Post recognised the capability for “an opening for female grace and skill,” in a sport which had importantly filled the gap in terms of a game accessible to both sexes. In a time where any suffragette movement was a relatively new idea, the seeming equality on the tennis court should not be ignored. Despite much social impetus, lawn tennis also gathered a great deal of competition amongst women. 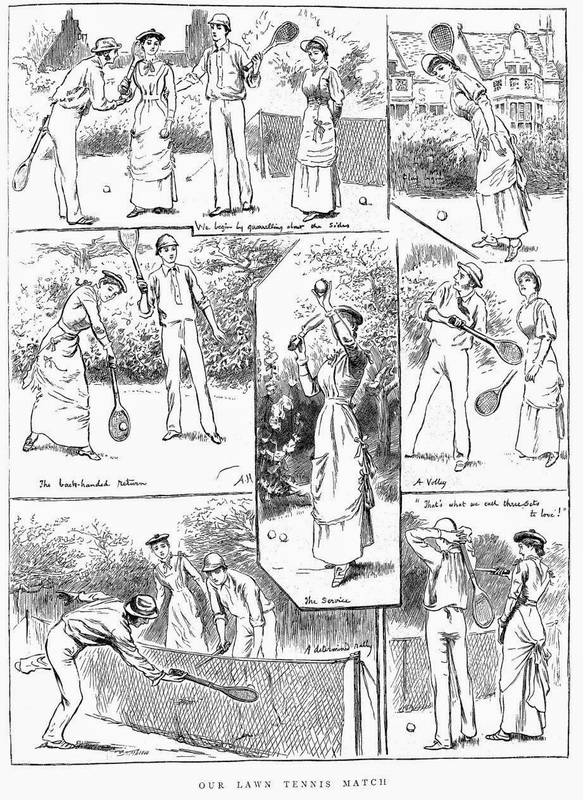 By 1884, just seven years after the inaugural male tournament, female participation was seen at Wimbledon - with Maud Watson becoming the first champion at the All-England Club. Other amateur players like 5-time-winner Lottie Dod were prominent pioneers of the ladies game, despite her adoption of a 'calf-length' dress much to the horror of many upper-class spectators. 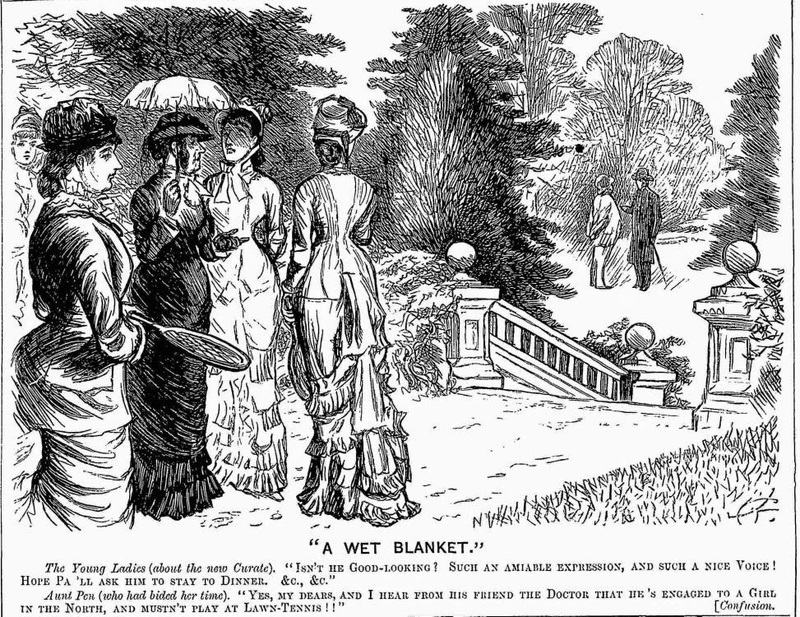 The focus on fashion was evident in Victorian England as most women played in the clichéd long dresses, much to the pleasure of men and much to their own discomfort. 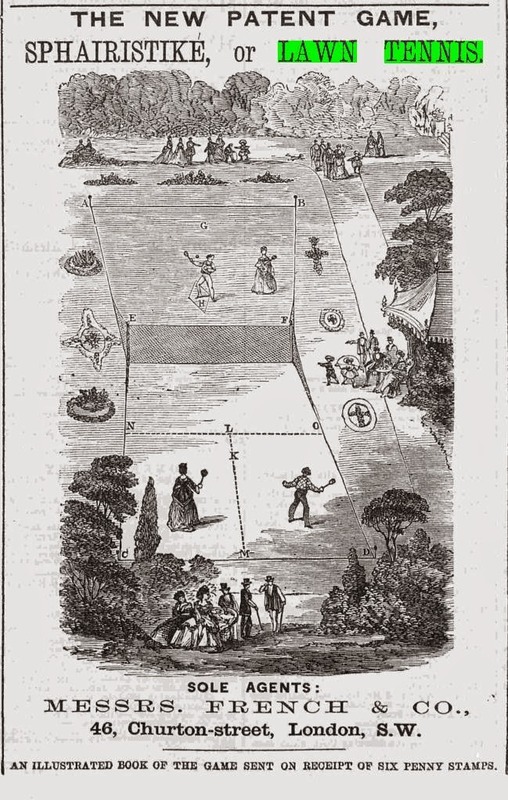 So there we have it, a rather brief look into the earliest days of Lawn Tennis - a game which once more brought with it ideas of class and sociability to the forefront of sporting conversation. Tennis offered a sport different from others created during the sporting revolution - it was the quickest to receive its own national competition, one which could combine competition and leisure & one which involved women right from the start. Tennis showed that the wealthier elites were open to exercise and physicality and new forms of leisure. It also provided an opportunity for individual brilliance, which only a select few sports could emulate, like golf and athletics - Victorian lawn tennis was a sport like no other - truly unique. Robert Lake, 'Gender and Etiquette in British Lawn Tennis 1870-1939: A Case Study of “Mixed Doubles”'. International Journal of the History of Sport, (2002) 29 (5), pp. 691-710.